URL announces Tsu Surf, Tay Roc, Daylyt, Arsonal, Charlie Clips and more for the November 20 mega-event in New York. The long-awaited lineup for URL's "Night of Main Events 6" has arrived, and it has the potential to be the card of the year. The November 20 event sees the URL returning to Irving Plaza for the first time since "Double Impact 2" at the end of March, the venue the league called home for its larger events for a couple of years before it made headlines for being the site of the Troy Ave shooting that impacted the entire New York hip hop scene. The card features five battles, involving established URL top tier regulars DNA, Tay Roc, Tsu Surf and Charlie Clips, as well as the return of Arsonal and the main stage league debut of Daylyt. There are also several battlers (T-Top, Brizz Rawsteen, Ill Will and Rum Nitty) who have less experience on the big stage but who have made their appearances count enough to look at home on a card of this magnitude. 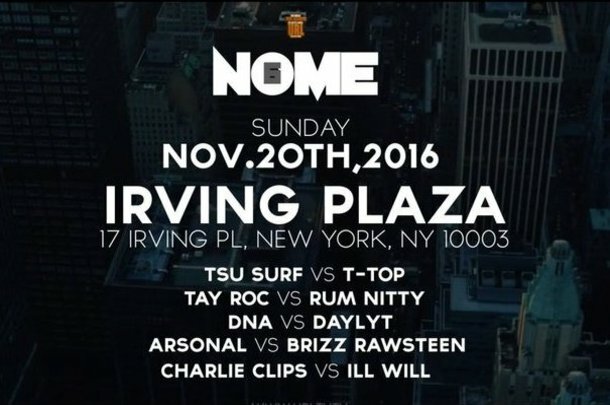 In what will likely be the battle that closes NOME 6, Tsu Surf takes on T-Top. Surf has established himself as perhaps the biggest name in the battle world, and also as someone generating buzz outside of the battle scene. With his music fanbase rapidly growing, it's possible that any battle could be his last for a while, and if that's the case here, he's at least likely to go out with a good one. T-Top is a name that people have speculated could lead the next generation of URL's top tier since he won Season 3 of Ultimate Freestyle Friday. After a dominating victory against Math Hoffa at "Unfinished Business 2," T-Top should be looking to continue that momentum against Surf, and with that, cement himself firmly as one of the top names in battle rap. People have been waiting for Tay Roc vs. Rum Nitty for what feels like years now. Nitty has been on fire this whole year with a classic vs. Ave and other strong showings against Charlie Clips and Ill Will on the URL stage. Roc is arguably the top battler on the URL platform right now, and has been building his name for years. Nitty has been calling him out through media and in battles, and on November 20, he's looking to take his place as the Gun Bar King of the URL. As for Roc, he's looking to show Nitty that he's at the top for a reason and that he won't be a stepping stone for Rum's career advancement. In Daylyt's second battle on the URL stage, he takes on one of the most active battlers in the culture, DNA. Day has made a mark on every stage in the world, and in his URL debut against Mike P, he left his imprint on the Smack brand and gathered a substantial buzz with that fanbase as well. DNA isn't simply going to roll over though, as he is one of the most experienced battlers on the planet, and knows as well as anyone how to win on this stage. This is an excellent test for Day, and if he's able to pull off a convincing win against DNA, it's very possible his next battle on URL will be even bigger. In addition to those we'll be seeing two of the best freestylers in battle rap, Charlie Clips and Ill Will face off against each other. And in the final battle of the evening, battle rap legend Arsonal, who since announcing his upcoming retirement has been on a killing streak, will take on one of the top rising names in battling, Brizz Rawsteen. The event goes down November 20 at Irving Plaza, and you can get tickets here. Brad is a battle rap fan who lives in Nova Scotia, Canada. He's been a BattleRap.com contributor since August 2015. Follow him on Twitter: @JackDeuce1988. Get the latest news, battles, and lyrics daily in your email inbox. We're great stewards of our readers' contact information and won't share your info with anyone. Copyright 2002 - 2019 © Battle Rap.